Does it sound familiar to you? There’s no better way to start your day than drinking a freshly brewed cup of coffee, and it’s your morning habit you can’t get rid of. No matter how busy you are in the morning, you will find time to visit a local coffee shop just to get your venti latte by your side. However, going to the packed coffee shop means wasting much time queuing, so you opt for visiting the empty cafe even though you don’t like the quality of coffee you get there. Hold on…Do you agree with the following? The good news: you don’t need to sacrifice the quality of your coffee. You can still get coffee-shop style perfection even if you’re pressed for time to wait in a queue or you just want to save money. The answer? Use your Nespresso coffee machine at home! First things first: being a true coffee snob, you know everything about the perfect cup of coffee, and it’s no wonder you’re picky about the coffee machines at home. Before making the purchase decision, you want to know what is the best Nespresso machine. And I’m here to help you! After using different Nespresso devices, I came to the conclusion that Nespresso Inissia is the best option for most coffee lovers. But what makes it any different from other espresso machines? To begin with, let’s find out basic information about this Nespresso coffee machine. Nespresso Inissia bundle is a capsule machine which makes espresso from pods sealed with coffee. Although many coffee lovers doubt whether coffee capsules make good coffee, using such machines has a variety of benefits (from spending less time on brewing coffee to more compact machine design). Since it heats up in just 25 seconds, there’s no need to wait before making your coffee selection. It’s you who can adjust the cup size with two programmable Espresso and Lungo buttons. One touch and your coffee is ready. 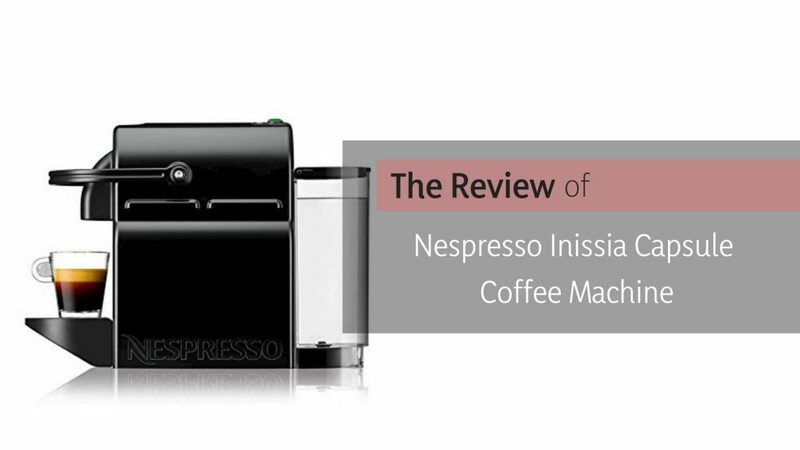 While looking for more information about Nespresso Inissia, I stumbled upon many online reviews. Even though it’s a simple coffee machine that can make only several coffee flavors, it is quite popular among coffee lovers and it has a high overall rating. It’s no wonder there are no complaints about its performance – Nespresso coffee machine comes with a 3-year warranty, so all customers are certain about the quality of this device. 19-bar pump pressure helps the user brew better espresso in comparison with less powerful coffee machines. compact and light design can fit any kitchen size and design. Plus, there are 7 available colors so even the pickiest users can find their favorite machine design. perforated drip tray is suitable for larger cup sizes and it drops down automatically when you remove your mug to catch drips. fast heating up takes just 25 seconds to prepare the coffee machine for usage. 24 fl.oz. water tank is enough to make up to 9 coffees without refilling the reservoir. automatic off mode switches the machine off after 9 minutes to save the energy. 2 programmable buttons for espresso and lungo preparation. When it comes to choosing the perfect coffee machine, users crave quality. For many potential customers, the fewer cons the machine has, the better. However, it’s important to find a coffee machine that suits match your needs as all people are different. 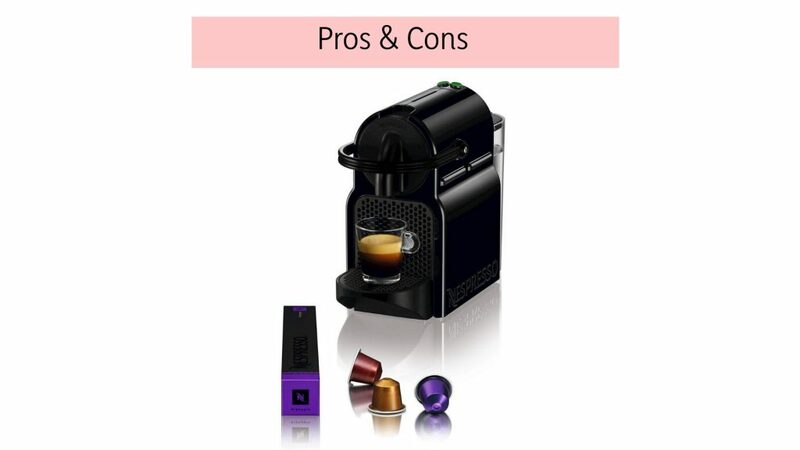 Here’s what I’ve found about Nespresso Inissia and its pros and cons. Knowing that you’ve found a coffee machine that suits your needs and wants at a reasonable cost can brighten you up. Even though Nespresso Inissia isn’t perfect and it has some drawbacks, these disadvantages can mean nothing if its advantages are important to you. If the above-mentioned cons aren’t crucial for you, keep on reading the review to find out more about my experience as it may help you decide whether it’s worth your attention or not. Nespresso Inissia Espresso maker can be a good option for many coffee lovers as it’s a compact and stylish device with a range of functions. Being fully automated, the process of making your espresso doesn’t take much time or effort. Moreover, it is available at quite a competitive price (around $150). The first thing I have mentioned about this machine is its stylish modern design. This coffee maker can fit any kitchen design as it comes in a full palette of colors (7 available options). Depending on your preferences, you can choose one that suits your needs and preferences. Not only is it stylish, but it is compact as well. Since it’s a light and compact coffee maker (5.29 lbs), it can fit it in any small kitchen, office, apartment, dorm room, etc. Because of its size, its water tank is small (24 fl. oz.) but this capacity is enough to prepare 9 cups of coffee. As you can see, it’s a simple easy-to-use device that can brew coffee fast. And if you’re interested in giving it a try, discover what you can get with your purchase. Nespresso Inissia is a coffee capsule machine, so it’s easier to use than automatic bean-to-cup coffee machines. There’s no need to use a tamper, filters, or grinders. The machine is very small and compact, and it’s packed in a small box, too. Unfortunately, I bought one without a frother. As I’m a latte-addicted, it was a problem for me. So, if you love frothy coffee beverages, get ready to spend more on buying the frother or check out other coffee makers like Mr. Coffee that comes with a recipe book for latte lovers. So, are you Interested in how to use Nespresso machine? In your customer box, you will find an instruction booklet that is aimed at teaching users how to use Nespresso machine. Although it must explain to the users how to make their favorite coffee, remove a tank and use 2 available buttons (lungo and espresso), the instructions are difficult to follow. Although it’s simple to use, you’d better find how-tos videos on Youtube instead of reading its instruction booklet if needed. It’s harsh but true: cleaning my brewing equipment has never been my favorite thing to do. I haven’t cleaned my coffee maker as often as I should, so this low maintenance coffee maker is a win-win solution for me. Capsule machines are probably the easiest machines to clean. If you want your coffee machine to last long years, follow the above-mentioned simple rules to keep it clean. If you believe that cleaning a coffee machine and descaling it is the same, I have the bad news for you then. These two processes are absolutely different. If you don’t descale your coffee machine, the mineral scale buildup can clog water flow, prevent water from reaching its optimal brewing temperature, and therefore make coffee not hot enough. Since it’s impossible to see the heating elements in a machine, it’s difficult to spot whether your machine has the mineral buildup or not. Thus, you need to descale your coffee maker from time to time. Descale your machine once a year if you use soft water or twice a year if you use hard water (since it contains a higher percentage of the minerals and it damages coffee machines faster). To understand what type of water you have, pay attention to the water tank as hard water leaves white marks on it. To tell the truth, it was difficult for me to understand how to descale the machine using the manual. Thus, I surfed the internet to find how-tos videos. Actually, there’s a big variety of educational videos for all Nespresso machine models. Luckily, Nespresso descaling is easy when you watch Youtube videos. NB: don’t forget to order your descaling kit to make the process easier. Nespresso Inissia has many benefits that most coffee lovers will find useful. Not only has it all necessary functions but it comes also with a 3-year warranty. As a result, it is a smart option for home or office. busy workers: if you need to speed up the coffee making process, using Nespresso coffee maker helps to deliver quality coffee with minimal effort. The machine heats up in just 25 seconds, and it doesn’t require much time to take care of it, so it means spending less time on coffee making. small business owners: since this coffee machine is compact and it doesn’t cost much, it’s just perfect for a small team. Plus, it makes preparing coffee and the cleaning process easier. espresso lovers: there’s no milk frother, so you won’t be able to make a latte or cappuccino. However, if you love espresso, this simple machine can suit your needs. people with small kitchens: one of the best things about this machine is its compact size. No matter how cluttered your kitchen is, this small coffee machine will fit its design. One thing I have learned over a week of using this coffee machine – it won’t be a good choice for people who prefer frothy coffee drinks like latte or cappuccino as there’s no option for these beverages. Customers love sharing the experiences and impressions, and their reviews help to understand more about the product. Since potential users rely on fellow customers’ experience, reading reviews can affect the buying decisions. Thus, many users search for genuine reviews before thinking about a brand as an option. All in all, although the coffee machine has some minor drawbacks, it can be a good option for espresso lovers as it has great benefits as well. 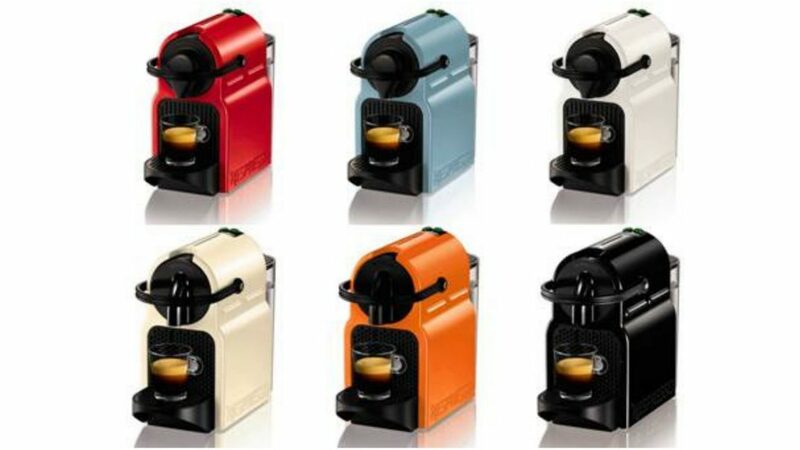 Espresso lovers rejoice – Nespresso Inissia espresso maker is everything you need! It’s a small functional capsule coffee machine that can provide coffee snobs with great coffee in several seconds. The machine can fit any kitchen size and interior design as it is compact and comes in 7 colors. Plus, it works without any mess and it doesn’t require much time to look after it – just descale it once in a month. Yes, capsules are a bit expensive but there’s a big variety of capsules that contain individual aromas, so every coffee lover will find a type he or she loves the most. Even though I’m not a big fan of espresso, I must admit this machine makes high-quality coffee without sacrificing its quality. For me, it’s not the best option as I love frothy coffee drinks. However, I will choose this machine for office if needed. And what about you? Would you like to give this machine a try?